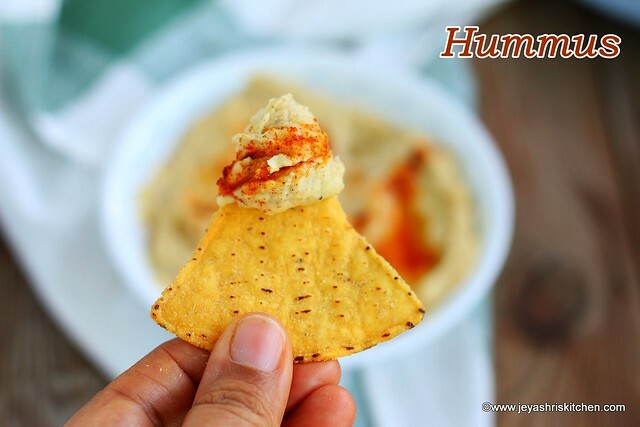 Hummus is a popular Mediterranean chickpeas dip,quite simple to make at home. I tasted this for the first time in a restaurant here in Singapore along with falafel and Pita bread. Later when i attended the cookery demo by Master Chef Nikita Gandhi,she taught Methi hummus recipe. But most of the hummus recipes use Tahini in it. The tahini we get here is expensive and comes in large bottles which is too big for a small family. Last year when we visited a friend for dinner,she made hummus and served with store bought Pita bread. It tasted so well. She told she didn't add Tahini and just added roasted sesame seeds. Later i totally forgot it,recently when we visited a Mediterranean restaurant here in Singapore,we had this Hummus along with other dips. I had some frozen chickpeas at home and immediately tried it today. It tasted so awesome and we had with store bought Tortilla chips. You can make this with Canned Chickpeas too. Soak the chickpeas for 10 hours or overnight. Wash it nicely and pressure cook for 8-10 whistles by adding enough water. The chickpeas should be very soft. Do not add any salt. Take out the skin from the cooked chickpeas. This will give a smooth texture to the hummus. Roast the sesame seeds in a pan. This will get roasted very fast so be careful not to burn this. Blend the cooked chickpeas,garlic,olive oil,lemon juice,roasted sesame seeds,salt and pepper powder. Add the reserved water to this while grinding. If you don't have any water after boiling the chickpeas,add warm water while grinding. This gives a nice texture to the hummus. Pulse it into a smooth paste. Once done,add it to a serving bowl. Drizzle the 1 tsp of olive oil on the top and sprinkle the paprika powder on the top. Hummus is ready to serve. You can serve this as a dip for chips and cut fruits and salad too. Pita bread tastes so well with Hummus. Hummus tasted well with dosa too. 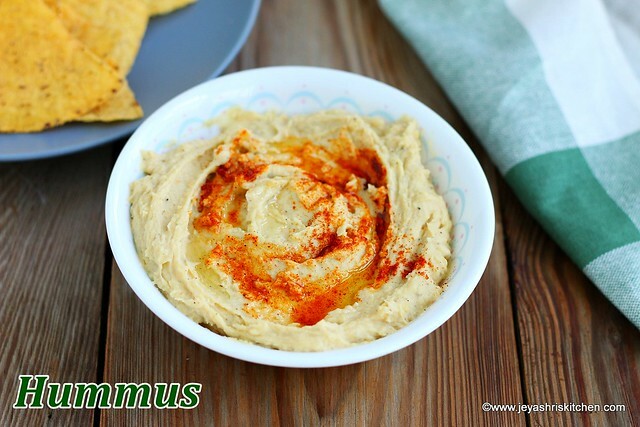 You can add more roasted garlic and make it Garlic hummus. You can add little more olive oil to get a goey texture. You can add a ripe avocado while grinding the hummus. This will give a nice texture to the home made hummus. I have chickpea flour. Can I use this to make hummus? Any suggestions on method? 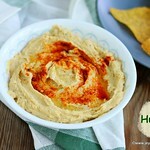 Hi you can not make hummus using chickpea flour. This can be kept in a air tight container in the fridge and kept for 10 days. Always use clean spoon to take it out.